Summer Grilled Tomato Soup - A Twist on Traditional Grilling! You can have your tomato soup all year round with grilled tomatoes! Too cold to go outside? Use your grill pan on your stove! 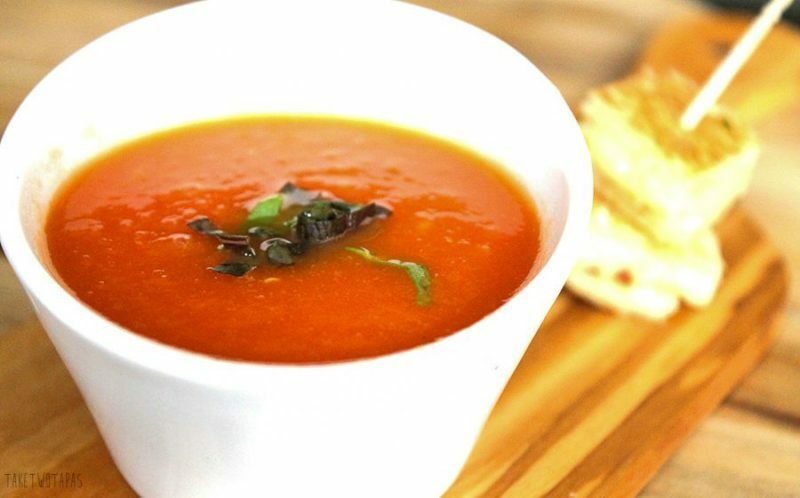 This Grilled Tomato Soup is comforting all year long! So, the temperature has been over 80F for the last 4 days, which means that summertime is officially upon us in South Georgia. Bring on the grilling and chilling in the backyard! I love to grill, actually Brooks grills and I sip cocktails while I supervise, and the kids love to eat outside. Summertime conjures up images of tomatoes fresh from the garden and watermelon spitting contests. Here were the fruits of our labor last summer in case you missed it. Heirloom tomatoes from the farmer’s market. Shop local! I love heirloom tomatoes because they are all meat! Brooks usually stops by the farmers market on his way back from Atlanta and brings me some ripe Roma tomatoes so I am hoping for lots of tomatoes to can and have all summer. While we are in the thick of warm weather, not too many people think of eating soup. But I am! Grill marks and smoky taste! I am always thinking about eating but this time, I am also breaking all the rules that say soup is just for winter. I love all grilled vegetables and I love vegetable soup so why can’t we combine them for a summer soup! You can serve this soup warm or you can eat it cold like a gazpacho. I used my indoor grill pan, this time, around since Brooks was out of town! Summertime is supposed to be fun but most of all it is supposed to be easy. What could be easier than a soup that only has 5 ingredients! Feel free to add any other ingredient that you like, such as garlic or onions, but I like the simplicity of just the tomatoes. When I was younger I used to eat tomatoes like apples. Just sprinkle a few salt grains onto the flesh and eating it like it was an apple. To this day, I love tomatoes in any form and you can always find some in my kitchen. The simpler the better. I hope you fire up your grill and keep it simple this summer! If you are a tomato lover like me then check out my Roasted Tomato Gazpacho Shooters and a traditional tapas favorite, the Pan Con Tomate! Both of these tomato recipes utilize “home-grown” or tomatoes found at the local farmer’s markets. Which is really the best part of summer besides not trying to drag the kids out of bed for school! 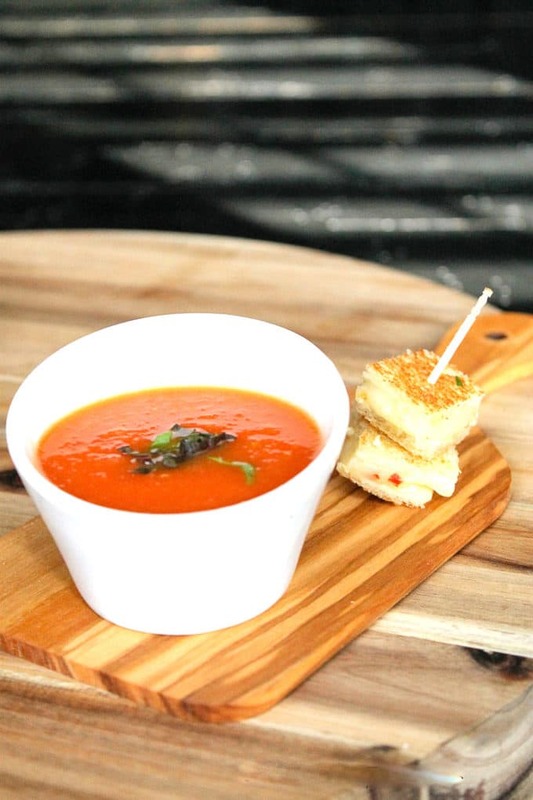 This summer grilled tomato soup pairs perfectly with my Spicy Grilled Cheese Stacks! This summertime soup only has 5 ingredients and comes together quickly! Heat up grill or grill pan if inside. Slice tomatoes crosswise in 1/2- 3/4 inch slices. Brush the slices with olive oil and sprinkle with salt. 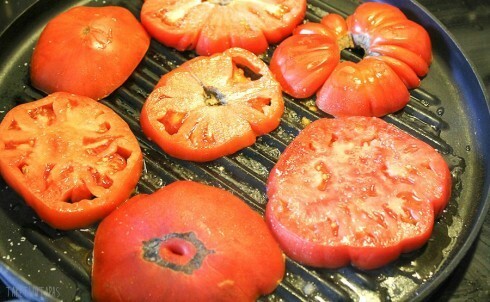 Grill for 5 minutes or until tomatoes start to break down. Remove from grill and place on a plate. Chop up cooked tomatoes and add to saucepan. Add chicken stock (or veggie stock) and hot sauce. Bring to a boil then simmer for 5 minutes. Remove from heat and either puree in a blender or insert your immersion blender and puree to your liking. I like mine a little chunky but it’s a personal choice. Serve warm with Spicy Grilled Cheese Stacks! Thanks Kristina! I crave them all year long! Love this soup, pinned & Facebook share! Also, totally agree, soup just isn’t for wintertime. We enjoy it all summer long. Wanted to stop by and say thank you again for sharing with us at #TryaBiteTuesday, hope to see you again this week! I love Tomato Soup but I haven’t tried grilling it first! I bet it gives it an awesome flavor. Just the right amount of smokiness! I can imagine eating this with a hot and very cheesy grilled cheese sandwich. Thanks Aprill! I eat it with my grilled cheese stacks or a cheesy quesadilla! Grilled tomato soup? Now that sounds divine! 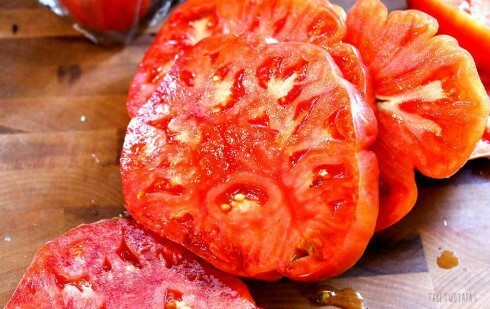 There is nothing better than a ripe summer tomato! 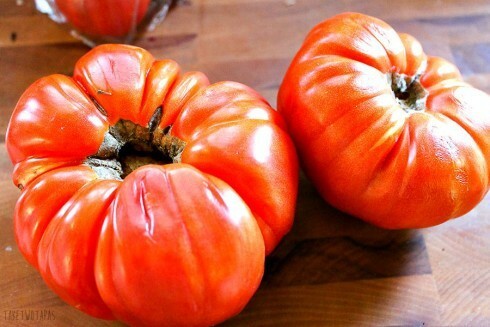 This sounds and looks like awesome summer grilled tomato soup. I would love to use fresh tomatoes from my garden to make this soup. Thanks for sharing. Yum! I LOVE soup, so I’ll have to try this homemade version. Thanks for reading Chastity! Drop me a line or a comment if you get a chance to try it and let me know how you liked it! Oh this look delicious, I like a thicker soup. I don’t usually have soup during the summer but I wouldn’t mind a bowl of this. I truly drool over each and every one of your posts. I am a huge fan of tomato soup, and can’t wait to try this recipe once tomatoes are more in season. Happy Grilling! Thanks Amanda! That means a lot to me! 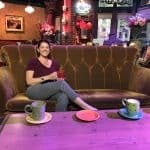 I love reading your blog too! Let me know how you like the soup once you get a chance to make it! Look at those tomatoes – beautiful!! I love that you grilled them for this soup – I’m sure it’s delicious! I’m definitely going to give this a try! Thanks for reading Patricia! I hope you get a chance to try the soup. Drop me a line or comment if you get the chance and let me know how you liked it! My son is s super picky eater, but he really like tomato soup. I’ll have to try out this recipe for him, it has to be better than the canned stuff I give him! Never would think to grill the tomatos.. sounds like a really good recipe. I am a big fan of tomato soup. My kids hate tomatoes but I LOVE them! There is nothing better than huge tomatoes fresh from a garden. The soup looks so good! I really love tomato soup, but I especially love grilled tomato soup. Your recipe sounds really good, thank you so much for sharing it! Thanks Jenn!! I hope you like it! Tomato soup is my absolute favorite and I have never thought of grilling the tomatoes first. Genius! I bet that lends for a nice rich smoky flavor. Bookmarking to make asap!! Thanks Shanna! I love the smoky touch it has! I can never get our outdoor grill right which is why my hubby does it. I like that I can use the inside grill pan too! Mmm! 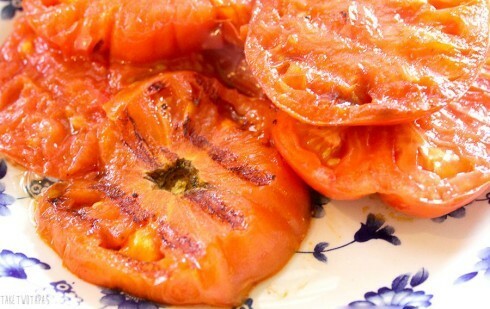 Grilled tomatoes are the best! I never thought about making them into soup. What a wonderful idea! I love this recipe! Not only does it look delicious but it’s made with fresh ingredients! That’s my way of cooking! Thanks Victoria! I like that it has so few ingredients so you can taste just the tomatoes! What an awesome concept! I am definitely going to try this out, we are huge tomato soup fans around here 🙂 Thank you! This looks so good! Probably because you snagged some gorgeous tomatoes to begin with. Thanks for the recipe to try this summer! Thanks for reading Miriam! I hope you give it a try! I just ate grilled cheese sandwich for dinner and lacked tomato soup! Thanks to this recipe, I can make it perfectly now. Love it! I love a tomato soup especially using home grown tomatoes in the summer. Will have to try it soon. Thanks Ali! I hope you like it! This sounds delish! We grow tomatoes in our little garden and always have an abundant amount. This would be a great way to use some of them. I love fresh tomatoes out of the garden and they taste good in the winter when I use my canned ones! Thanks Robin! You can still grill in the Fall too! Yum. Soup and grilled cheese! I’m not sure that I’ve ever had grilled tomato soup – sure, I’ve had roasted, fire-roasted, and just regular tomato soup but I can’t remember having a grilled variety. Looking forward to trying this… especially with the addition of grilled cheese croutons! Thanks for sharing!! Thanks for reading Jordan! The heirloom tomatoes handle the grill better because they are meatier! I hope you like it!